DealsMachine (ex. aHappyDeal) is a Chinese internet-shop that is on the market since 2011. The assortment of products is quite traditional: cellphones and accessories, cheap MP-3/4 players, digital cameras, completing parts and electronics for computers, different car electronics like DVD players, GPS navigators and others. The comments on this shop are quite contradictory. On the first glance most of the buyers never face any difficulties and receive their purchases. On the other hand, you have to be very attentive while ordering. You should notice what products are added to the order and what the price is because there were certain cases when several products that had been in your basket were issued as an order, though you never tried to completely purchase them. If you receive an item of a bad quality, that is known to be very seldom due to the fact that all the products are tested with quality control, the shop gives you an opportunity of refund or exchanging it. All in all, the shop sells its products for medium prices. As a result you are able to purchase certain products for such silly prices like one cent with free delivery. Moreover, you can use the aHappyDeal coupons, that give you extra discount. And any discounts are never to be odd. 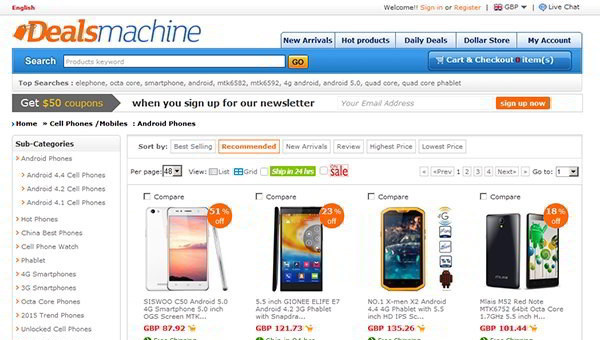 I found DealsMachine very easy to deal with,when I had a problem. I am now looking for another phone, but the DealsMachine website has been down for about three or four weeks, whenever I try to view it. My top hasn't arrived and the support email address does not exist. WHAT DO I DO?? Did you use PayPal? If yes, you could open a dispute in the Resolution Center in your PayPal account. I like this internet shop because is very affordable. Also the assortment of items is very good. Anything that is cheap is good for me. Communication and concern of your product are very good and efficient. Dealsmachine is a convinient seller. Fast respone, fine service, and everything you need just mail them and an answer will arrise on your mail in 24 hours. Dealsmachine is a very good e-shop. Excellent customer service.